Zowie has existed for just over a decade now, and their mission hasn’t changed since they were founded way back in late 2008: to bring the best competitive FPS gaming gear to the public, without any unnecessary frills or feature bloat. With the help of Counter-Strike legends such as SpawN, HeatoN, and NEO they created some of the most iconic gaming mice of the past decade, with the EC (Emil ‘HeatoN’ Christensen) and FK (Filip ‘NEO’ Kubski) lines being the most popular ones. It had been a while since they released a completely new model though, and with the release of the S line the wait is finally over. The S’s shape is designed from the ground up to provide yet another amazing Zowie shape, with all the features that the other Zowie mice are known for, plus an upgraded sensor. Does this new mouse offer enough to have a substantial spot in Zowie’s lineup or is it a bust? Read our review to find out all of that and more. 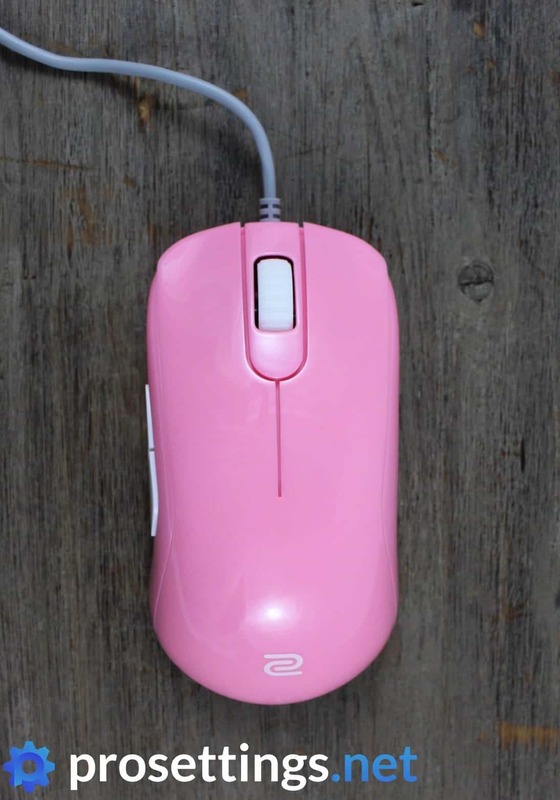 Allow me to address the elephant in the room: yes, this mouse is pink. There’s also a light blue version available, but currently there’s no regular black or white version of this mouse to be bought. 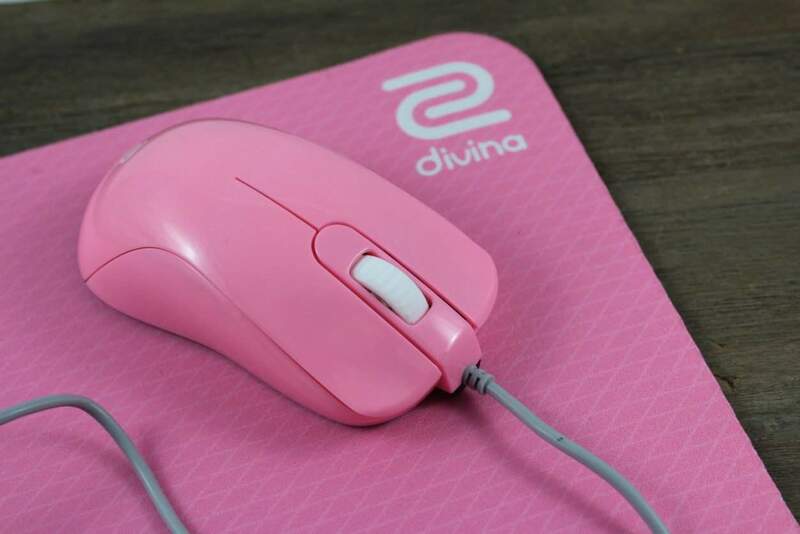 That’s because this iteration of the S line falls under under Zowie’s Divina line, which is a special line of products that’s made in order to support women in esports and strive for more equality in the esports scene. That doesn’t mean it’s a ‘girls only’ mouse though. The colors they chose are pretty out there when compared to regular black color schemes, but they’re not super flashy, if that makes any sense. 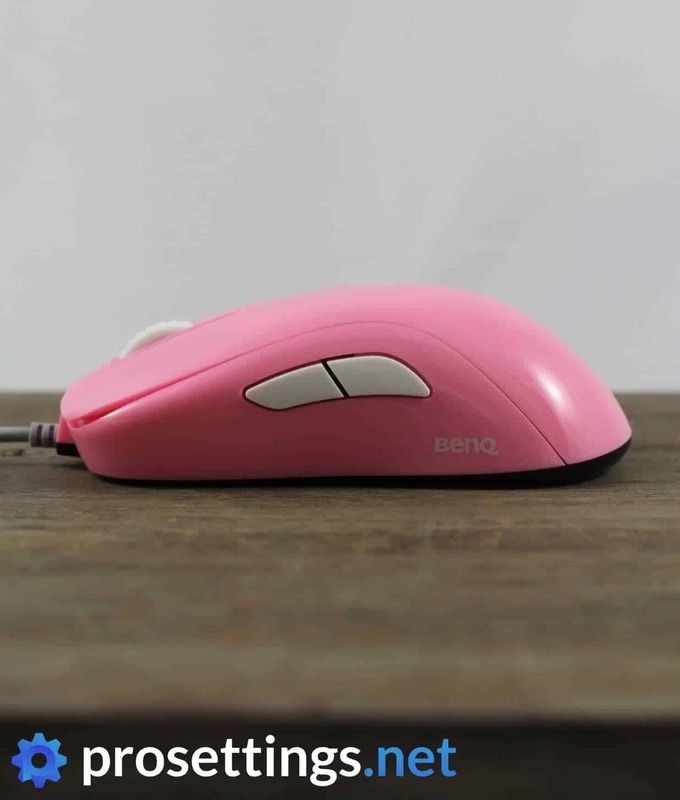 The color on this mouse isn’t a neon ‘in your face’ sort of pink but rather a more subtle and subdued blend of which the actual tint depends on the sort of light you put it in. In order to illustrate that I photographed the mouse using a bunch of different light sources, which is why it might look different from picture to picture. I’m personally more of a fan of regular black mice if I had to choose, but I don’t really care about the looks of my gaming gear all too much (as long as it performs well it’s fine by me) so the color of this mouse isn’t something that annoys me or anything like that. Real men wear pink anyway. 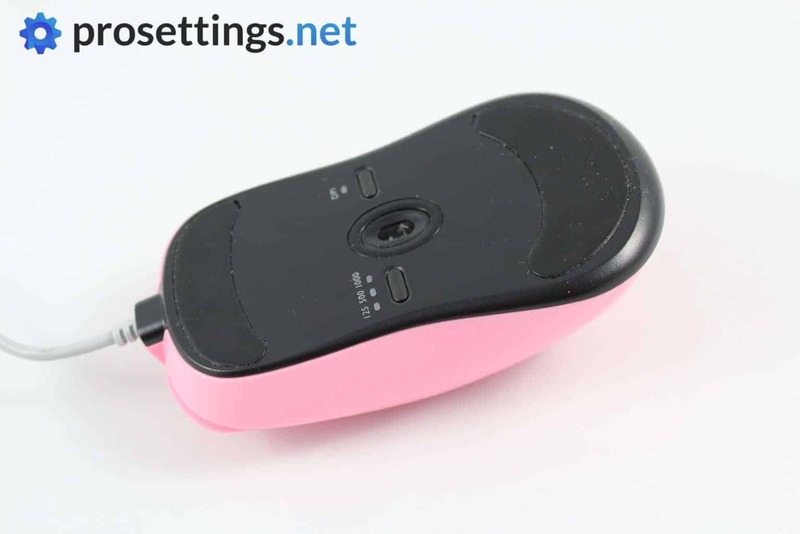 The S2 is a small-medium sized mouse with an ambidextrous design. What’s immediately noticeable is that Zowie has opted to skip the side buttons on the right side of the mouse which were present on all of their former ambidextrous models. This was done to eliminate any possible interference with grip. When it comes to the shape you can best compare this to Zowie’s FK model if you’d have stuck the FK shape in some sort of compactor and gently applied pressure on all sides. The S line is a bit taller, wider, and shorter than the FK line, making it more of a ‘ball’ shape than the pretty thin and sleek FK, if that makes any sense whatsoever. It’s a pretty small and ‘compact’ mouse which still fills your palm somewhat, albeit not as drastically as with the ZA12, and that firmly sets the S series apart as having a shape on its own as opposed to being an ‘improved’ version of other mice from Zowie. 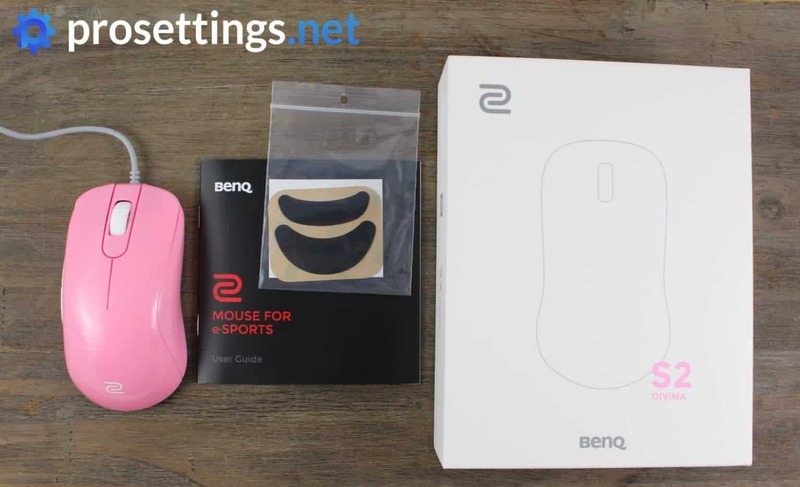 The S2 Divina edition comes in the regular Zowie box, only this time it’s in white as opposed to the regular black. On the box is the outline of the mouse, along with the Zowie and BenQ logos and then (obviously) the name of the mouse. Inside the box you get the mouse, documentation, a regular Zowie sticker, and a pair of replacement mouse feet. The extra feet are standard for Zowie products, but it’s always much appreciated when companies do include these extra mouse feet as it saves you from having to hunt down replacement feet if/when the feet get worn out after hours and hours of intense gaming. The S2 has, as mentioned before, a pretty short and compact design and true to Zowie tradition it feels amazing to hold in your hand. Due to the slightly larger front sides of the mouse (when compared to the FK line) and the safe design it’s going to be very easy to pick up for all grip types, provided your hands aren’t too large or too small for the mouse. Thanks to the larger surface area on the sides of the mouse it’s also really easy to change grips on the fly. That’s not something that I (or most people) do during gaming, but it is a testament to how well this new shape accommodates a wide variety of grip styles. I keep saying it when I review Zowie mice, and it keeps ringing true: the shape is undoubtedly one of Zowie’s major strong suits. The S2 comes with a glossy coating (this is the same for the blue version) and while I’m not personally a fan of glossy coatings I have to say that I don’t really mind this. When I’m gaming my hands get sweaty pretty easily, but I’d be lying if I said that I had any grip issues throughout my testing period. What I did notice is that the surface itself tends to feel sticky and dirty rather easily, but this is the same for most glossy mice that I use and it’s solved with a quick passage of a cleaning cloth so that’s not a real downer as far as I’m concerned. On the bottom of the mouse you’ll find two large feet (which are the same ones as you’ll find on the FK) and they provide a nice and controlled glide straight out of the box. There’s almost no break in period with these stock feet either, so that’s always a plus. The main mouse clicks on this mouse feel a tad lighter to me than what you’d get from the older Zowie models, and that’s a bit surprising since they’re still the same Huano switches according to Zowie. Huanos aren’t known to be the lightest switches on the planet but that’s not something that’s to be considered bad; some people prefer stiffer clicks while others swear by hair trigger lightness. The clicks (while lighter than ‘standard’ Zowie clicks in my opinion) still aren’t the lightest of the bunch, but I never felt fatigued while using them, nor did I miss shots because I didn’t manage to actuate a button in time, so all is well on this front. People who feel like the clicks on other Zowie mice are too heavy will be pleased with these, as will people who are used to Zowie’s heavier Huano clicks. They managed to find a great balance here. The scroll wheel on Zowie mice will always be polarizing. Zowie makes competitive gear for competitive FPS/shooter gamers, and the mouse wheel is specifically designed to have fewer and more defined steps when compared to most other gaming mice for that reason. This is fantastic if you need to perform accurate operations (such as selecting a weapon from a whole row of weapons) with your scroll wheel, but the stiffness and overall feel of the wheel definitely won’t please everyone. Purely for gaming this is a good mouse wheel though, and the middle mouse button is easy and satisfying to press. The side buttons are conveniently placed and easily distinguishable when gaming, and they also provide a very nice and crisp click. The travel time seems to be shorter when compared to earlier Zowie models as well. All in all the buttons on the S2 are great. 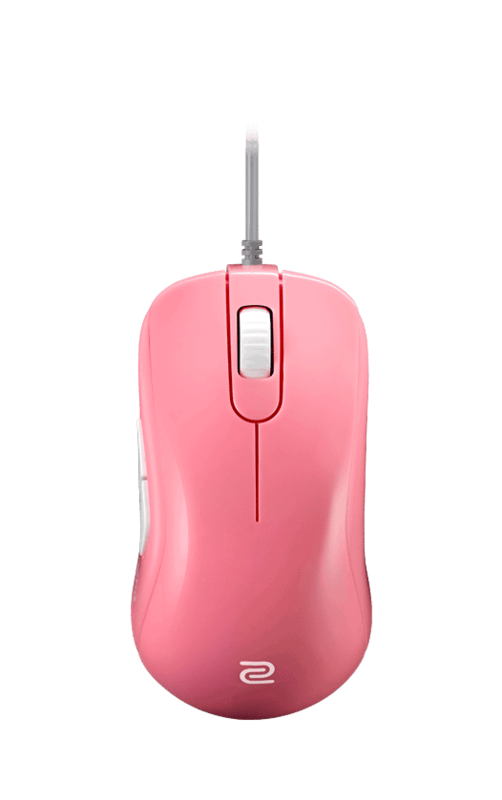 People who want lighter and snappier clicks on Zowie’s mice will be especially pleased with this new line of mice. Doing the usual pressure tests on the S2 Divina yields positive results. 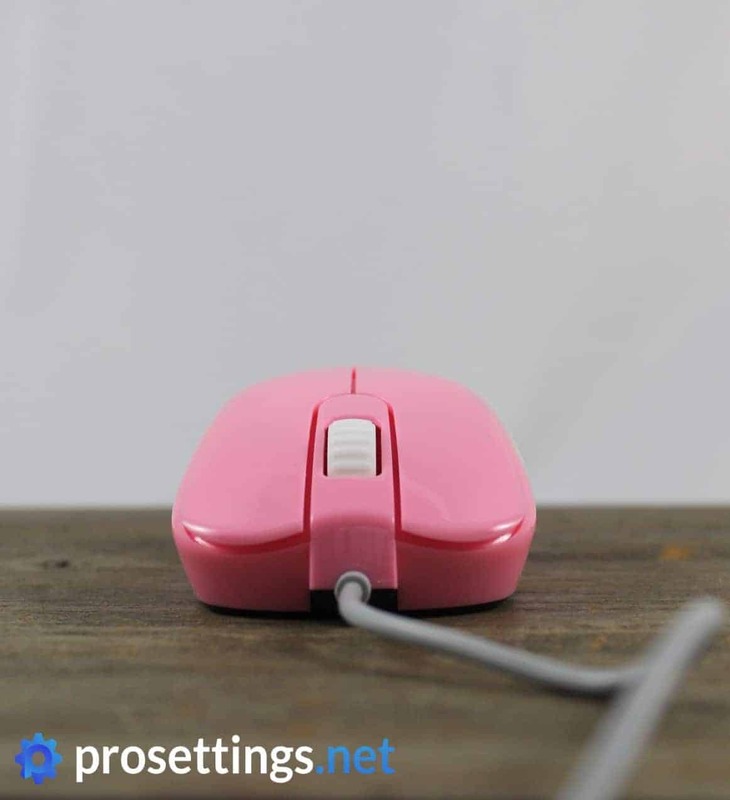 There’s no squeaking or annoying rattling whenever you put pressure on the mouse or flick it around, so no issues there at all. I will mention that, when I hold the mouse right next to my ear and shake it around, I can hear a bit of a rattle near the scroll wheel. There’s absolutely no way to hear this during regular usage (certainly not with game sounds coming out of your speakers or headset) so this is an absolute non-issue but I thought I’d mention it. The cable remains the same as on the other Zowie models. It’s a pretty flexible rubber cable that does its job of staying out of the way quite admirably. Some other companies have started making cables that rival aftermarket cables when it comes to flexibility, so the S2’s cable isn’t the best stock cable on the market, but nevertheless it remains one of the best standard cables out there in my opinion. Something neat that they’ve done here is the made the cable come out of the mouse at a slight angle so that it doesn’t make contact with the surface that the mouse is on straight away. It seems like a small and inconsequential decision but couple that small angle with a decent mouse bungee and you really notice that the cable hardly touches the pad, depending on how much cable you leave before you ‘bungee it up’. 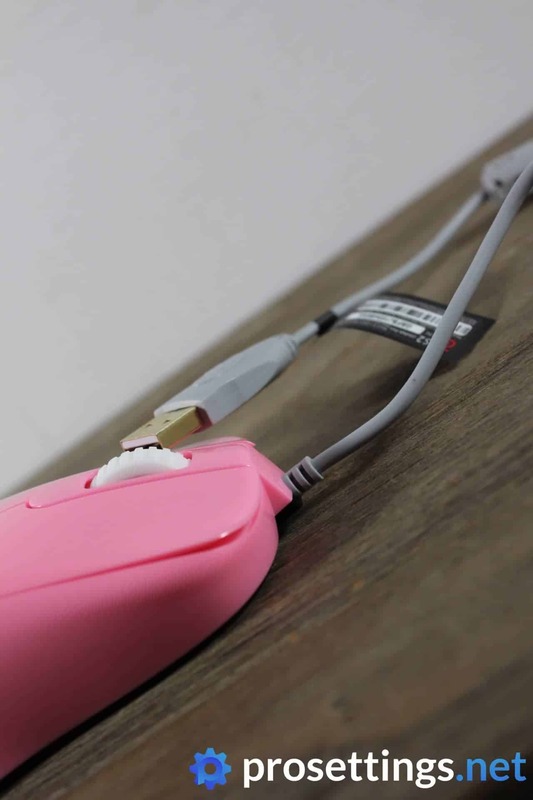 That’s not to say that you need a bungee to make this mouse usable though. I always test mice with and without a bungee and as is usual with Zowie I didn’t have an issue with the cable in either test scenario. Another small detail is that they moved the information sticker that’s on the bottom of most mice to a little tab at the end of the mouse cable so that there’s nothing on the bottom of the mouse that shouldn’t be there, leaving as little factors that could affect glide as possible. Will most people notice this change? No. But it is nice to see that Zowie also thinks of the little details in order to squeeze every last bit of performance out of their products. I feel like I can be pretty brief here. The days of gaming mice using sensors that can spin out or have acceleration or any of that nonsense are over. Most new (FPS) gaming mice coming from reputable brands have a flawless sensor and the S2 isn’t any different. The S2 houses the 3360 sensor, which perfectly translates every movement you make on your desk to the game without doing any predicting, snapping and so on. No one to blame but yourself (or lag) if you miss that absolutely crucial headshot on the enemy healer, in other words. Zowie are famous for their plug and play principles. If you’re a gamer who’s playing at a different LAN tournament every weekend you don’t want to be messing around with an endless stream of software programs to set up all of your peripherals, so Zowie mice are good to go the moment you plug them into your machine. You can change the DPI and polling rate on the bottom of the mouse if you want, and that’s it. No nonsense, just headshots. 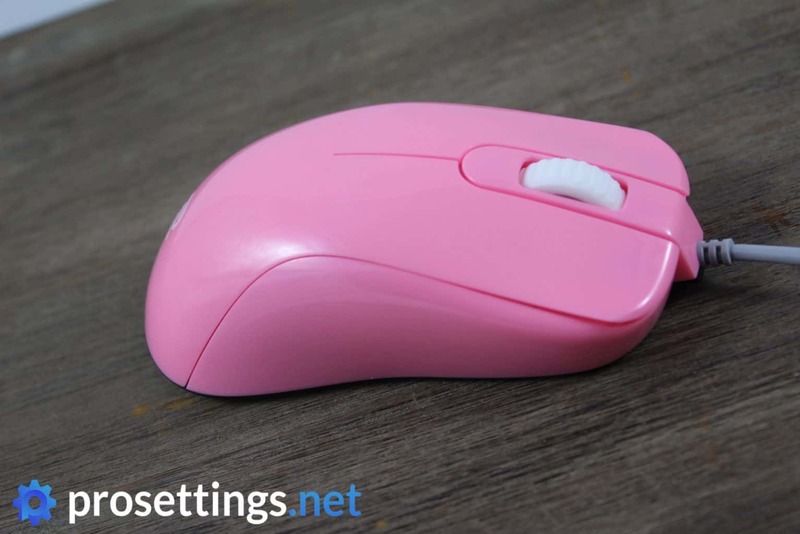 The S2 is a small to medium sized mouse with a very safe shape and that trademark ‘it feels so good‘ Zowie shape, so it should suit almost every grip type under the sun if your hands are the right size for this mouse. 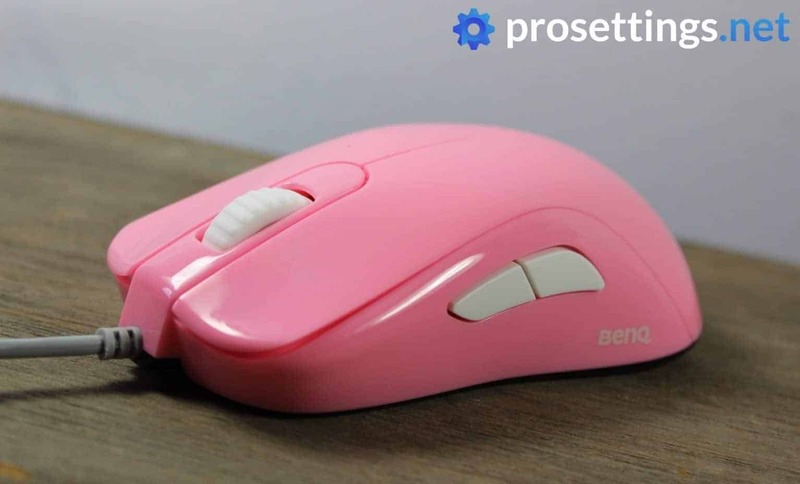 The fact that it’s a little ‘boxier’ than the FK models means that people who found the FK either too long or too thin will be really happy with this particular model, but you don’t need to be a Zowie aficionado in order to appreciate this mouse. If nothing else, Zowie are known for their absolutely amazing shapes, and the S line shows that they haven’t lost that touch at all. If you like everything that you’re reading here but you have larger hands then you can always steer towards the S1 model, which is the exact same as the S2 but with slightly larger dimensions. It’s been a while since Zowie released a new mouse, but boy was it worth the wait. The S2 continues Zowie’s heritage of having absolutely amazing shapes and improves on the older Zowie models by offering a 3360 sensor, as well as by doing some smaller stuff such as angling the cable upwards for minimal contact with the playing surface and moving the information sticker towards the end of the cable. The clicks also feel lighter and snappier, despite Zowie using the same switches as on older models. Will these small improvements be noticed by the majority of people? Some will, some won’t, but that doesn’t matter. The S2 isn’t just a refresh of an existing model: it’s an entirely new mouse and design that offers up everything that’s made Zowie such a popular brand in the first place, and more. 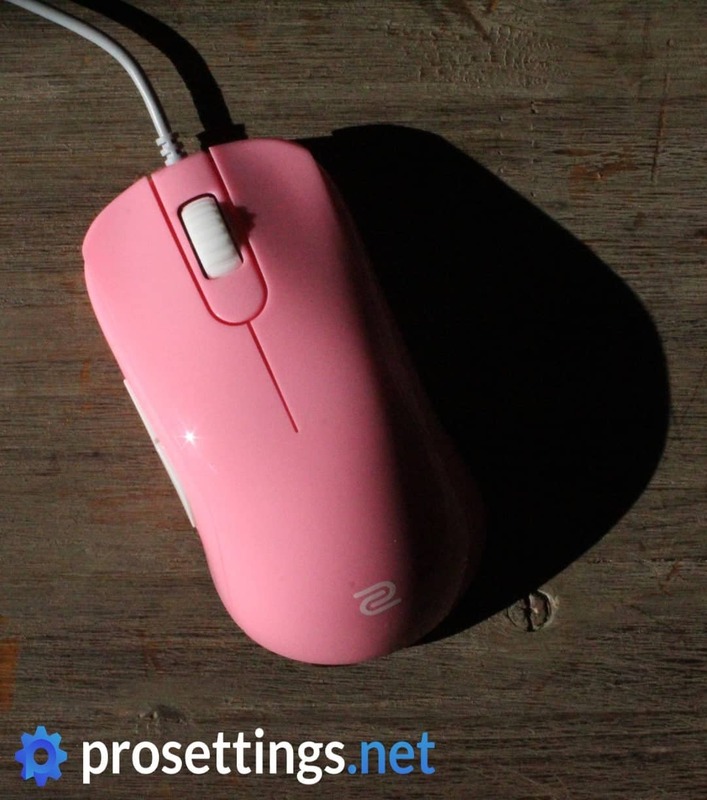 The coating (only glossy is available at the time of writing this review) and scroll wheel certainly won’t please everyone, but if you can look past that there is a lot to love about this new Zowie mouse, and I absolutely encourage you to check it out for yourself. Amazing reviews of gaming peripherals with the perspective of a gamer! Have you tried the new-ish Corsair K70 Low Profile? I can’t seem to find good gamer reviews for that! Thank you very much for the kind words. That’s exactly what we try to do here at ProSettings, we want to offer perspectives from a gamer point of view, so thanks for noticing that! That being said; I don’t currently have the K70 Low Profile on my list of gaming products to be reviewed, but I will make the necessary inquiries to try and get a review unit, so stay tuned! I have 19.5 cm x 10.5 cm hands, should i get the S2 Divina or the S1? S1, for sure. I even have the same hand size as yours but I use palm grip so Im using an EC2-B. The S1 is a dream tho for claw or fingertip grip. Definitely the S1, as Kaid already pointed out. Thanks Kaid, always appreciated when our community helps each other out! I guess it depends on your grip style. I have 19x10cm and use a claw grip where the mouse is usually 45 degree angled and takes support from the right side of my palm, and the G100s is my dream shape. Therefore I’d say the S2 is better fit, as the dimensions are very close. I have 18 cm x 10 cm hands, should i get the S2 Divina or the S1? I’d recommend the S2 then but if you like larger mice you could also go for the S1 with your hand size in my opinion. If you want to go for an S version then do go for the S1 as the S2 would be way too small for your hands I think. Hello my grip is claw, I saw a video on YouTube and said that the za model was ideal for the claw grip since the ec was for palm and the fk finger grip. He also said that the new divine was good with the claw grip but could also be used as a palm grip but they were not designed mainly for a claw grip. I would say to go for the S2. It’s perfectly adequate for claw grip. In the end these ‘this mouse is ideal for X grip style’ are only guidelines since everybody is different, so always take those with a grain of salt. 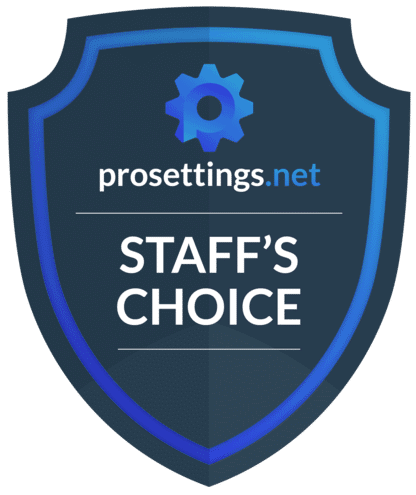 Nice review of the S2 (it’s my main mouse). I have been enjoying your original content. Also suggest you check out the Havit Low Profile tenkeyless board. I think it’s really good for gaming due to the low-profile clicky Kailh choc switches (less wrist strain than full-height boards). It’s gone under the radar of the mechanical keyboard and gaming communities but in terms of actual in-game performance, I think it’s one of the best. Hi! Thanks for the kind words, glad you like the content. That certainly looks like an interesting keyboard, I’m gonna take a deeper look at it for sure, thanks for the suggestion!